With just two fingers on the control-bar, the giraffe lopes easily along as if it were roaming on the Serengeti Plain. Its spots are applied by wood-burning and no two are ever alike. 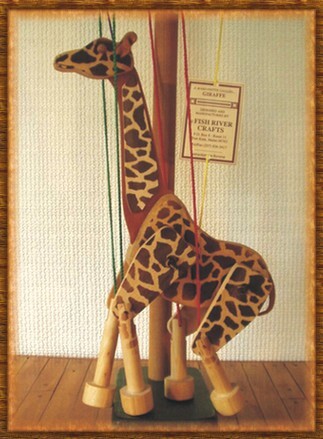 Our Giraffe marionette is a completely original, animated wooden motion-sculpture at a very reasonable price. ...they've got it!! Everyone is simply drawn to these uniquely animated 'Motion-sculptures'. They're drawn by the lifelike design, the sensational movement and the natural materials, beautifully finished.